There is practically no economic activity nowadays which is not outlined, whether partly or totally, by the process of standardization. The worldwide acceptance of standardization is closely related to the economic globalization and the transformation of regulatory processes at the national, regional, and international levels. Standardization helps in reducing, simplifying, and organizing matters which are apt to become diversified, complicated, and chaotic if left uncontrolled. It is the process of formulating, issuing, and implementing standards. Standardization creates value at many levels. The output of the process of standardization is the creation of standards. The standardization process is often stated as the degree to which work rules, policies, and operating procedures are formalized and followed. Standardization is said to be the activity of establishing and recording a limited set of solutions to actual or potential matching problems directed at benefits for the party or parties involved balancing their needs and intending and expecting that these solutions will be repeatedly or continuously used during a certain period by a substantial number of parties for whom they are meant. Standardization is also defined as an activity of establishing, with regard to actual or potential problems, provisions for common and repeated use, aimed at the achievement of the optimum degree of order in a given context. Important benefits of standardization are improvement of the suitability of products (including services) and processes for their intended purposes, prevention of barriers to trade and facilitation of technological co-operation. Standardization can be described as the “activity of establishing a standard”. Standardization in various standards is subject to specific rules. Standardization means creating uniform business processes across various divisions or locations. The expected results are processes which consistently meet their cost and performance objectives using a well-defined practice. Standardization, thus, reduces the risk of failure. Process standardization is an important prerequisite for the standardization. The major aims of the process of standardization are given below. Fitness for purpose – It is the ability of the process, product or service to fulfill a defined purpose under specific conditions. Any product, process or service is intended to meet the requirements of the user. Occasionally the expectations of the users can be at variance with the actual purpose. Also, it is quite often difficult for the users to state the desirable quality of the process, product or service. Standardization process helps by identifying the optimum parameters for the performance and the method for evaluating product conformity. Standardization also helps in laying down conditions for using the process, product or service, as otherwise any failure of the process, product or service due to improper use may be attributed by the users to a deficiency or lack of quality of the process, product or service. Interchangeability – Interchangeability is the suitability for a process, product or service to be used in place of another to fulfill a relevant requirement. Interchangeability can be introduced through an intentional standardization process. Process of standardization assists in the interchangeability even if the processes, products or services are created in different countries. Variety reduction – Variety reduction is one of the main aims of standardization and it helps in optimizing the number of sizes, ratings, grades, composition and practices to meet prevailing needs. Balancing between too many and too few varieties is in the best interest of both the producers and the consumers. Securing compatibility and interface consistency – Compatibility is the suitability of processes, products or services to be used together under specific conditions to fulfill the relevant requirements, without causing unnecessary interaction. Standardization aids in establishing compatibility between various machines or subsystems and permits expansion features and information exchange amongst different systems. Compatibility between various components and functions created through standardization in turn secure interface compatibility and consistency. This also helps in simplifying the communication. Health and safety of consumers – Through the process of standardization, it is ensured that the process, product or service not only meets the requirements of health and safety but they also do not pose a threat to human health or property both under normal use as well as under possible misuse. Standardization for safety aspects also broadly covers the requirements to ensure the safety of equipment (e.g. a dustproof enclosure for equipment) and that of employees and the environment (e.g. flameproof enclosures for equipment in an environment where concentration of explosive gas can be there). Environmental protection – Environmental protection is an important aim of standardization. The target through standardization is to focus on preserving nature from damage which can be caused either during the production of the product or during its use or disposal after use. Improved utilization of resources – Standardization helps in the achievement of maximum overall economy through better utilization of resources (e.g. capital, human effort and materials). In manufacturing organizations, it is this aspect of standardization of materials, components and production methods that makes it possible to reduce waste and to carry out mass production in an economic way. Product quality standards – Standardization can ensure certain levels of product quality. Standards concerning product quality are required to be prepared, focusing not only on the need of the organization but also to meet the needs of the customers. These standards are to satisfy the requirements of the processes employed as well as the requirements of safety and environment conservation for meeting the regulatory and mandatory legislation. Enhanced communication and understanding – In case of the transfer of goods and services, standardization provides means of communication which are to be used between different parties. It spells out the information which is to be recorded in a precise and documented form. Because of it, standardization contributes towards better communication and understanding in a large variety of settings. It is well known that the standardized signs play an important role in places such as airports, railway stations and highways for instance. Facilitating communication and learning – Standardization helps in providing same information to all concerned and thus help in communication. This information can be in form of specifications, measured parameters along with the quantities and the tolerances allowed, or monitoring of the performance along with the methods followed. These information which are in the form of documents, are a good source of learning for the employees. Transfer of technology – The technology transfer is facilitated through the process of standardization. Standards created through the standardization process acts as a good vehicle for technology transfer, since they incorporate the results of advances in science, technology and experience. These standards reflect the state of the art in technical development. As standardization is a dynamic process, standards are updated as new technologies are developed. Improvement in the efficiency – Standardization helps in better utilization of resources since it simplifies and homogenizes the raw materials, spares, consumables, and products. This simplification and homogenization helps in enhancement of the production efficiency. Standardization can be used to formulate flexible rules through technical adjustments by carrying out necessary unifications and simplifications. Streamlining of procedures – Standardization helps in streamlining of all the procedures in the organization. These procedures can be related to stores and purchase, sales and marketing, production and technology, process control and quality control, and issues related to human resource and technology etc. Through standardization conflict between departments and processes can be eliminated thus encouraging the team work. Standardization also helps in avoiding duplication of work. Facilitating competitive environment – Standardization of different functions, evaluation and assessment methods promotes competition in the performance because objective comparison becomes feasible. This competitive environment helps in in the improvement of all the activities which in turn improves the performance of the organization. Removal of trade barriers – Restrictions on the export of processes, products or services by the introduction of some technical barriers to trade, such as arbitrary product requirements, are being viewed with great concern. Standardization prevents such non-tariff barriers to trade by harmonizing requirements in a manner that promotes fair competition. Customers can be convinced about the quality level of a product which has been manufactured according to a recognized standard. By its very definition, standardization is aimed at achieving maximum overall economy. It intends to improve performance and to give management more control over operational performance. The most popular measure for performance is the cost of executing the process. Although it is no less important, the quality of the results is also often considered. Advantages from standardization, beyond direct cost and quality improvements, include (i) the process becomes more reliable and the variations in quality shrink, (ii) lesser expenses in development of innovative new practices as well as in the administration of processes, and (iii) comparison of the performance between different departments of the organization becomes easier. The main commercial advantages of standardization are (i) technical interchangeability, (ii) compliance with regulations, and (iii) improved customer confidence. The value generated through standardization is given in Tab 1. 3 Greater ability to react to regulatory changes Standardization improves the organizational ability to quickly adapt to regulatory changes. 4 Enhanced technical interchangeability Standardizing of the processes improves the technical interchangeability and hence, enables the organization the use of standard hardware and software solutions. 5 Improved customer confidence The higher levels of standardization in the organization lower the probability for process driven mistakes. This in turn improves the overall quality and thereby improves the confidence of the customers. Standards provide benefits to different sectors of society. Some of the benefits of standardization are as described below. For manufacturers of the products, standardization rationalizes the manufacturing process. It eliminates or reduces wasteful material or labour. It reduces inventories of both raw material and finished products as well as the cost of manufacture. For consumers of the products, standardization assures the quality of goods purchased and the services received. It provides better value for money. It is also convenient for settling disputes, if any with the suppliers. For traders, standardization provides a workable basis for acceptance or rejection of goods or consequential disputes, if any. It minimizes delays, correspondence etc., resulting from inaccurate or incomplete specification of materials or products. For technologists, standardization provides starting points for research and development for further improvement of the technology of the production processes so as to improve the efficiencies of the processes and to produce better products with consistent qualities. There are five principles of the process of standardization. These principles are (i) consensus, (ii) due process, (iii) openness, (iv) right to appeal, and (v) balance. These principles show that the standardization process is a market driven and bring in checks and balances throughout the standardization process to bring fairness, breadth, and market relevance to the standards. As stated earlier, the output of the process of standardization is the creation of standards. Ideas for standards arise in a variety of ways. A market leader may decide that it is time to standardize its technology to grow the market. A market lagger may want a standard to be created so as to catch up with its competitors. Suppliers of peripherals may realize that they can save costs if an interoperability standard can be used by all. A safety issue may have surfaced. Or a new and promising technology can be widely adopted if it is standardized. The principles which underlie the preparation of a standard or the amendment of the existing standard include (i) fulfillment of the generally recognized needs of industry, trade, technology and other sectors, (ii) safeguarding of the interests of both the producer and the consumer, (iii) representation of the largest possible consensus of opinion between all the interests concerned, (iv) aiming at maximum overall economy through better utilization of the resources, and (v) being subject to periodic revision and amendment so that the standard can be kept up to date to reflect the latest advances in technology and the progressively changing conditions in the environment. For producing standards of high quality and integrity, the standardization organization is to have a repeatable, documented, proven process. The process of producing standards appears to be complex and overwhelming. Yet it is summarized in a straightforward step-by-step manner below. 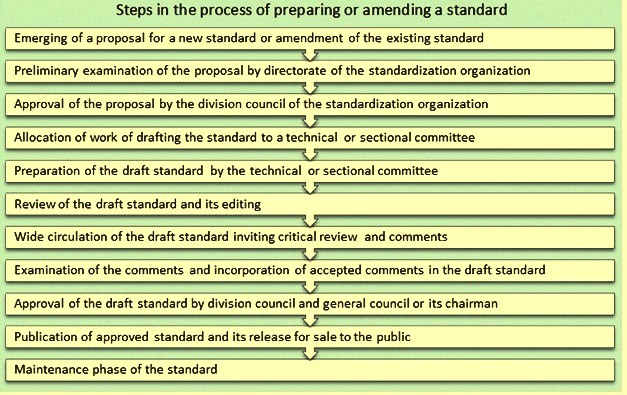 The process of preparing a standard or amending an existing standard normally consists of several steps. These steps (Fig 1) are described below. The first step consists of emerging of a proposal for a new standard or the revision or the amendment of an existing standard. The proposal can emerge from a representative of any sector of the economy (such as a trade association or a professional association). The directorate of the standardization organization preliminarily examines the proposal to determine whether it is consistent with the underlying principles for the preparation of standards. The division council of the standardization organization decides to approve or reject the proposal for the preparation of new standard or amendment of the existing standard. After the approval by the division council, the work of drafting the standard is allotted to the existing technical committee or sectional committee. This committee does the maximum work involved in the preparation of the draft standard. The technical committee is to work within the framework of the governing policies and procedures for the preparation of the standards. The members of the committee are required to have good technical knowledge about what is to be standardized. Also, they are to understand that the preparation of a standard needs consensus where the views of various parties are to be accommodated. Further, the committee is required to have a balance of members who can represent the needs of both suppliers and consumers. Representatives from academia and government can bring additional balance to the committee. The technical committee prepares the draft standard or alternatively, the committee may appoint a subcommittee and/or panel for preparation of the draft. After the draft has been prepared, the technical committee reviews it extensively and then passes it on to the secretariat for editing and wide circulation. The draft is widely circulated. The aim of wide circulation is to inform every interest in the country or abroad which may be affected by the draft and to invite critical review and comments. The comments on the draft are systematically examined by the technical or sectional committee. In the light of committee discussions, the final version of the draft is drawn up by the secretariat incorporating the comments accepted by the technical or sectional committee. The final version of the draft is submitted to the division council for approval and finally to the general council or its chairman. Once approved by these offices, the draft gets the status of a standard. The approved standard is then published by the secretariat and the published standard is then released for sale to the public. The new standard or amendment of the existing standard is given wide publicity by the standardization organization. The standard after publication or revision is put to use. At this stage, it goes into the maintenance phase. During the maintenance phase of the standard, it is normal to discover that updates to the standard are needed because of the advances in the technology. The process for updating of the standard is carried out by amending the standard. In case no amendment is required in an existing standard, still the standard is to be reaffirmed after a certain period. For reaffirmation of an existing standard, the process to be adopted is same as that of creation of the new standard.